About this Eraser Stick:Push Top To Advance Eraser.Hold Top Down And Push In Eraser To Retract.Rubber Grip.Special Instructions:Rush Service:Catalog Quantities Only.One Color And One Location. About this Swivel Eraser:Protective Swivel CaseSwivel Out To UseSpecial Instructions:Rush Service:Catalog Quantities Only.One Color And One Location. About this Rase - A - Round Eraser:Perfect for educational programs. Exceptionally priced. Great for themed promotions. High quality rubber.Special Instructions:Gold Rush Service not available on multi-color. About this Erasers:Rectangle design. Bright neon colors. Ideal for children.High quality.Special Instructions:1 Day Rush: 1 color, 1 location. PMS color matches are not available with 1 Day Rush. About this Mood Erasers:Rectangle design. Changes with the heat of your hand!High quality.Special Instructions:1 Day Rush: 1 color, 1 location. PMS color matches are not available with 1 Day Rush. About this Eliminator Eraser:High quality rubber for smudge-proof erasing. Slanted ends for easy use. NOTE: Product comes with Prop 65 warning label. Label reads: "WARNING: This product may contain carcinogen, which is known to the State of California to cause Cancer and Reproductive Harm. For more information, go to www.P65Warnings.ca.gov. Special Instructions:Gold Rush Service not available on multi-color. About this Round Pencil Sharpener Eraser Combo:White eraser.Steel blade.Bottom section catches pencil shavings.Special Instructions:1 Day Rush: 1 color, 1 location. PMS color matches are not available with 1 Day Rush.Warning: Choking Hazard. Small parts. Not for children under 3 ys. About this Round Eraser:Round, colorful eraser.1 1/2" round latex-free rubber eraser.Special Instructions:Rush service: 1-color/1-position required. Item color assortments are not available. About this Acheiver Pencil Sharpener Eraser:2-in-1 eraser and pencil sharpener. Cap ends cover eraser on one end and collects pencil shavings on the other end.Special Instructions:Rush service: 1-color/1-position required. Item color assortments are not available. About this Push Stick Eraser:Classic push action style.5" white eraser.Special Instructions:1 Day Rush: 1 color, 1 location. PMS color matches are not available with 1 Day Rush. About this Jumbo Eraser:Rectangular latex-free rubber eraser.Special Instructions:Rush service: 1-color/1-position required. Item color assortments are not available. About this The Triad Eraser Sharpeners:2 sharpener sizes. Eraser tip. Clear safety cover flips open to empty shavings.Steel blade.Special Instructions:1 Day Rush: 1 color, 1 location. PMS color matches are not available with 1 Day Rush.Warning: Choking Hazard. Small parts. Not for children under 3 ys. About this Shell Eraser:Eraser features a hard shell case with a white eraser.Material: Plastic case.Special Instructions:1 Day Rush, available upon request for 1 color, 1 imprint location orders. About this Pencil Top Stock Eraser - Mini Police Collection:These high-quality erasers come in a wide variety of colors and several different designs, and with a relatively low price, these erasers provide exceptional value. The erasers come in several different designs including a blue police hat, a yellow police badge or a black police car. These erasers are specifically designed to last a long time, and many people have reported that the erasers continued to work after being used frequently during a school year by students. Usually, a traditional pencil was sharpened until it could no longer be used before the eraser wore out. Customers have given several reviews that describe these erasers, and in all of the reviews, the customers claim that they are very satisfied with the product. These erasers can be given away to potential customers as marketing tools when a business gives out mechanical pencils or traditional pencils. There are many benefits to purchasing these pencil erasers. Some of these include the different designs that are available, the high level of durability, the superb reviews, and the ability to give them away for marketing purposes. CHOKING HAZARD — Small parts. Not for children under 3 yrs. Production Schedule Varies, please contact us. About this Pencil Top Stock Eraser - Train:Pencil Top Stock EraserTrain. CHOKING HAZARD — Small parts. Not for children under 3 yrs. Production Schedule Varies, please contact us. About this Die Cut Eraser - Star:Eraser die cut into fun shapes. Available in 4 colors. About this Pencil Top Stock Eraser - Recycle Symbol:Pencil top erasers that have recycling emblems on them are a fun way to boost awareness for environmental programs. There are many ways that companies try to get their name out for customers to see; there are also many ways that companies try to help the environment in their local communities. One way that companies can use that will bring awareness to environmental issues is by giving away items that have a recycling emblem on them. Pencil top erasers that sit on pencils or that can be placed on one's desk are great ways to promote recycling programs. Businesses who give away products with the recycling emblem are seen as environmentally friendly companies. Combining these erasers with pencils, informational packets, recycling center policies, or recycling containers are great ways to encourage the public to recycle. It creates a positive energy about one's company; it allows customers to participate in helping the environment by joining forces with businesses that help the environment too. Promotional products like pencil top erasers are great ways to encourage customers to do the right thing, and when you add your logo, they serve as a billboard for your brand. When customers recycle, they will remember the company who encouraged them as doing the right thing as well, promoting the company in a positive public light. CHOKING HAZARD — Small parts. Not for children under 3 yrs. Production Schedule Varies, please contact us. About this Pencil Top Stock Eraser - Lips:Red Centrifugal Molded Lips Shape Pencil Top Eraser. The Pencil Top Eraser Is Recommended For Use On Ferruled Or Unpainted Pencils Only. CHOKING HAZARD — Small parts. Not for children under 3 yrs. Production Schedule Varies, please contact us. About this Pencil Top Stock Eraser - Cheese Wedge:Yellow Centrifugal Molded Cheese Wedge Shape Pencil Top Eraser. The Pencil Top Eraser Is Recommended For Use On Ferruled Or Unpainted Pencils Only. CHOKING HAZARD — Small parts. Not for children under 3 yrs. Production Schedule Varies, please contact us. About this The Triad Eraser Sharpeners, Full Color Digital:2 sharpener sizes. Eraser tip. Clear safety cover flips open to empty shavings.Steel blade.Special Instructions:3 Day Rush: 1 location imprint.Warning: Choking Hazard. The toy is a small ball. Not for children under 3 ys. About this Round Pencil Sharpener Eraser Combo, Full Color Digital:White eraser.Steel blade.Bottom section catches pencil shavings.Special Instructions:3 Day Rush: 1 location imprint.Warning: Choking Hazard. Small parts. Not for children under 3 ys. About this Mood Die Cut Eraser - Circle:Erasers die cut into fun shapes. Changes color with the heat of your hand. About this Pencil Top Stock Eraser - Moose:Centrifugal Molded Moose Shape Pencil Top Eraser. The Pencil Top Eraser Is Recommended For Use On Ferruled Or Unpainted Pencils Only. CHOKING HAZARD — Small parts. Not for children under 3 yrs. Production Schedule Varies, please contact us. About this Pencil Top Stock Eraser - Transit Bus:Centrifugal Molded Transit Bus Shape Pencil Top Eraser. The Pencil Top Eraser Is Recommended For Use On Ferruled Or Unpainted Pencils Only. Shipped In Assorted Pastel Colors Of Pink, Blue, Green, Orange And Yellow. CHOKING HAZARD — Small parts. Not for children under 3 yrs. Production Schedule Varies, please contact us. About this Pencil Top Stock Eraser - School Bus:Yellow Centrifugal Molded School Bus Shape Pencil Top Eraser. The Pencil Top Eraser Is Recommended For Use On Ferruled Or Unpainted Pencils Only. CHOKING HAZARD — Small parts. Not for children under 3 yrs. Production Schedule Varies, please contact us. About this Figurine Stock Eraser - Alligator:Centrifugal Molded Alligator Shape Eraser In Assorted Pastel Colors. Shipped In Assorted Pastel Colors Of Pink, Blue, Green, Orange And Yellow. CHOKING HAZARD — Small parts. Not for children under 3 yrs. Production Schedule Varies, please contact us. About this Figurine Stock Eraser - Jr. Farm Animal Collection:Centrifugal Molded Junior Farm Animal Shape Erasers In Assorted Pastel Colors And 10 Assorted Styles. Shipped In Assorted Pastel Colors Of Pink, Blue, Green, Orange And Yellow. CHOKING HAZARD — Small parts. Not for children under 3 yrs. Production Schedule Varies, please contact us. About this Pencil Top Stock Eraser - Moo Cow Jr.:Pencil Top Stock EraserMoo Cow Jr. CHOKING HAZARD — Small parts. Not for children under 3 yrs. Production Schedule Varies, please contact us. About this Pencil Top Stock Eraser - Ear Of Corn:Centrifugal Molded Ear Of Corn Shaped Pencil Top Eraser. The Pencil Top Eraser Is Recommended For Use On Ferruled Or Unpainted Pencils Only. CHOKING HAZARD — Small parts. Not for children under 3 yrs. Production Schedule Varies, please contact us. About this Pencil Top Stock Eraser - Airplane:Centrifugal Molded Airplane Shaped Pencil Top Eraser. Shipped In 5 Assorted Pastel Colors Of Pink, Blue, Green, Orange, And Yellow. The Pencil Top Eraser Is Recommended For Use On Ferruled Or Unpainted Pencils Only. CHOKING HAZARD — Small parts. Not for children under 3 yrs. Production Schedule Varies, please contact us. About this Pencil Top Stock Eraser - Race Horse:Centrifugal Molded Race Horse Shape Pencil Top Eraser In Assorted Pastel Colors. Shipped In Assorted Pastel Colors Of Pink, Blue, Green, Orange And Yellow. The Pencil Top Eraser Is Recommended For Use On Ferruled Or Unpainted Pencils Only. CHOKING HAZARD — Small parts. Not for children under 3 yrs. Production Schedule Varies, please contact us. About this Figurine Stock Eraser - Moo Cow:Figurine Stock EraserMoo Cow. CHOKING HAZARD — Small parts. Not for children under 3 yrs. Production Schedule Varies, please contact us. About this Pencil Top Stock Eraser - Firefighter Collection:Pencil Top Stock EraserFirefighter Collection. CHOKING HAZARD — Small parts. Not for children under 3 yrs. Production Schedule Varies, please contact us. About this Die Cut Eraser - Square:Eraser die cut into fun shapes. Available in 4 colors. Thank you Jeanette, Susan and Michelle for your positive reviews on our Jumbo Eraser. We know custom erasers are a convenient item to have in classrooms! The Jumbo Eraser is great to give as a classroom giveaway! Reward your students with promotional Jumbo Erasers they can use in class and at home. Thank you Natalie and Aidan for your reviews on our promotional Mood Erasers. We know these are popular because of its color changing feature. The Mood Erasers are not normal custom erasers. They add style and fun to your classroom or office. Give these fun promotional erasers to your students or employees. They’ll love to watch the colors change! Changes with the heat of your hand. Available in blue to white, orange to yellow, purple to pink, and green to yellow. Thank you Ronald and Oliver for sharing your thoughts on our Custom Brain Eraser Pink. It’s a fun Top 100 item that can promote intelligence, health, and fun! The Custom Brain Eraser - Pink is a fun item to give to students! If you’re students are excelling on certain subjects, give them this promotional eraser as a reward. If you're looking for a budget-friendly, yet fun give-a-way or small thank you gift that is sure to boost their spirits, then the Custom Brain Eraser is a great choice! The Custom Brain Eraser is a customer voted "Top 100" item! The Custom Brain Eraser is the perfect give-away item for your clients, friends, and neighbors. The Custom Brain Eraser is personalized to include your business's logo and brand message. The Custom Brain Eraser is eye-catching in bright-pink. The eraser functions as both a useful gift and a miniature billboard, reminding people of you and your business. The Custom Brain Eraser is compact, allowing for lower shipping rates for higher quantities. Perfect for mailers! Production Schedule Varies, please contact us. With over 150 promotional erasers available in our selection, you’ll find the perfect one to erase all the other options. We have brain erasers, pencil sharpeners with erasers, eraser sticks, round erasers, jumbo erasers, mood erasers, pencil top erasers, die cut erasers, and more! Erasers are great to remove any written mistakes. 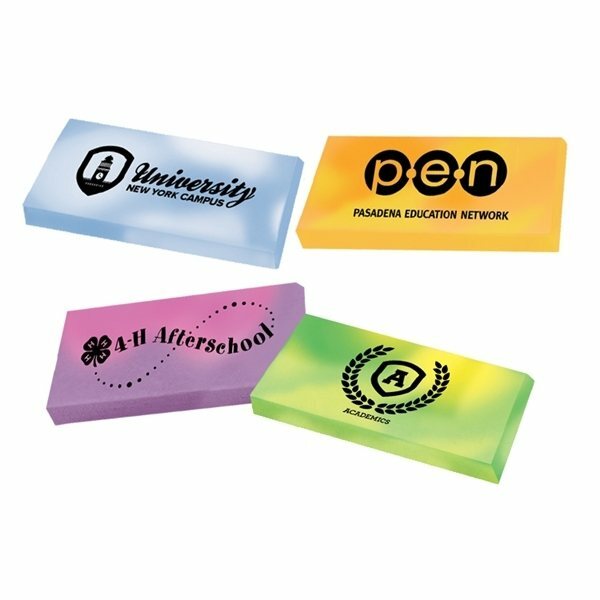 Make your paper clean with our promotional erasers. Promotional pencils are great for anyone to correct their mistakes! Place your logo in front of the promotional eraser that will help market your company. Look through our selection of erasers. Shop here! Just like our customers, AnyPromo sets the bar high when it comes to making big brand impact, while getting the best bang for your buck! 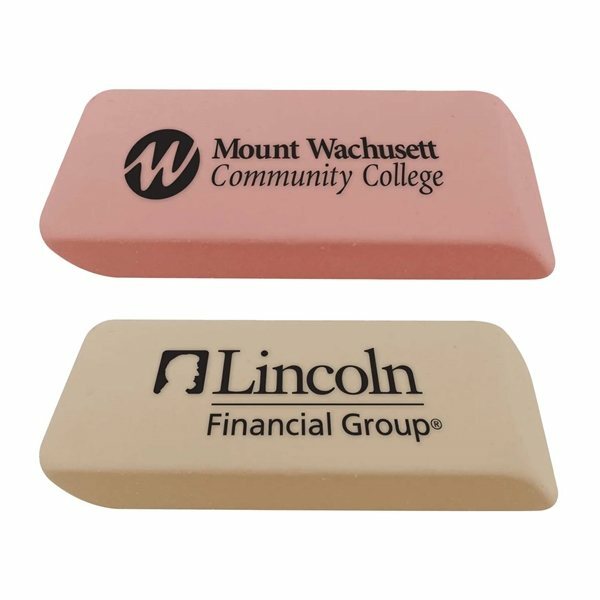 Click through our inventory of promotional erasers to find what best fits your goals. These in-demand items aren’t the kind that wind up in the trash cans. Save money and make a BIG hit at events with our specially priced writing accessories. Great for making corrections, cleaning up a sketch, and adding flare to a pencil top, erasers make pencils cool again! Check out hot sale erasers now at AnyPromo. Below you’ll find a most wanted list of some of our trending pencil eraser swag. Every item is available and ready for ordering through our helpful staff. Promotional erasers are good for students and working professionals. If you’re giving away pencils, then you definitely need erasers to make the ultimate duo giveaway. Give promotional erasers at college fairs, office parties, and more! You’ll want your company logo imprinted on this fun, useful item. Our featured list of erasers include our top sellers in this category. Don’t miss out on this convenient marketing tool that will help clean your mistakes.